During a presentation on Elk Grove City Council's exploration of placing a sales tax hike on the 2018 ballot, another controversial issue appeared if ever so slightly in that context. That issue was revenue generated the Wilton Rancheria's proposed $500 million casino resort in Elk Grove. According to the memorandum of understanding and state gaming compact, Elk Grove will receive about $120 million from the tribe for the fiscal effects the casino, when and if it goes into operation, will have on the community. In discussing the payments that amount of about $4 million annually, the Elk Grove City Council has beaten the drum on how these payments were a financial shot in the arm for city finances. During his presentation, assistant to the city manager Christoper Jordan discussed the proposed casino and its effects on city finances. Jordan's comments were made in the context of additional revenues the city could expect over the next few years. Those revenues come from three sources - additional funds from reduced revenue neutrality payments to Sacramento County; transportation funding from the recently enacted statewide gasoline sales tax hike; and the agreement with the Wilton Rancheria. With regards to the extra savings from reduced revenue neutrality payments to Sacramento County. Jordan said that money is earmarked for several projects. Among those projects is the cost of building the city's animal shelter and funding of its ongoing operations. For the increased gasoline sales tax revenue coming from the State of California, this too is committed to specific city budget shortfalls. These funds will help reduce - but not eliminate - the city's ongoing $8 million road maintenance backlog that has been accumulating for at least the last five years. And finally, Jordan discussed the payments from the Wilton Rancheria. As noted, the Elk Grove City Council has repeatedly promoted these payments over the 30-year term of the agreement as providing revenue for funding community needs outside the effects on crime and traffic the casino will have on the city. "The Wilton Rancheria agreement comes up a lot in conversations we've had," Jordan said. "Those funds that are identified in that agreement with the tribe go towards their initial impacts like transportation and police services." Jordan added, "it doesn't provide some larger financial windfall, it is really meant to represent those impacts they're creating and address those from a financial standpoint." So, what this tells me is that when taking either the informal or formal poll, Elk Grove residents probably asked, “Why a sales tax increase? 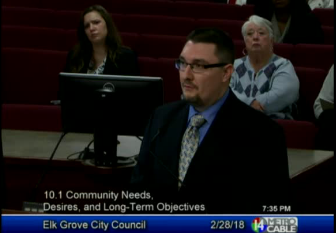 What about all the money the city will be getting from the casino?” The Elk Grove City Council basically shot themselves in the foot because of how they went on and on about the hand over fist revenue that will be generated by the casino. And it was left to Christopher Jordan to clean up their mess. I seem to recall the casino is also required to contribute about a quarter million bucks a year to local non-profits. The only windfall I see in all this is the non-profit corporation Mayor Emeritus Gary Davis runs, and Chuckie Hitchkock is a board member of.